My bracelets are absolutely gorgeous! I bought 5 of them for the dancers on my senior company dance team, and they've really helped to bring us together as a team. We wear them 24/7! 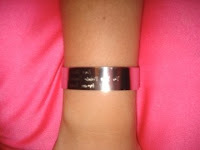 I found your website by using Google to try and find a website to personalize bracelets. Thank you so very much!